Sutton on the Forest School » Smoothie Bike Science! Year 2 and 3 were visited by the North Yorkshire Rotters and their smoothie BMX bike to learn about how to reduce food waste. The children were very surprised to learn that the amount of food wasted by families in the UK every year was the enough to fill Wembley stadium! One of the ways we learnt how to reduce food was to turn fruit and vegetables into tasty smoothies. We all had a go at pedaling the smoothie BMX bike to blend our fruit into smoothies. It was very tasty! Every child was given a measuring cup, food bag clip and recycled pencil to help them reduce food waste at home. We looked at more tips and reducing waste facts on the love food, hate waste website and decided to waste less of our fruit at snack times at school. 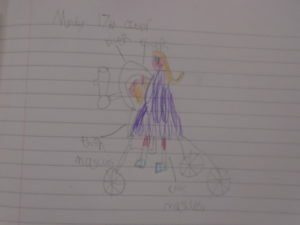 We have been learning about growth and health in science and after we went on the smoothie bike, we drew diagrams of which muscles we used to power the bike and make our delicious drinks. Many thanks to the North Yorkshire Rotters for taking the time to come and visit us – it was a very informative afternoon!